On a Sunday afternoon in the fall of 1919, the George Patton and his wife invited the Eisenhowers over for dinner. George Patton also invited another guest, Brigadier General Fox Conner, an expert in military strategy and administration. 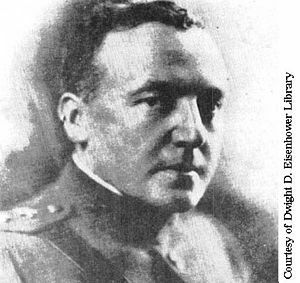 Conner graduated from West Point in 1898 and had served as General John J. Pershing’s Chief of Operations and trusted aide during World War One. Conner was an intellectual and an avid student of military history and operations and well respected throughout the military – Pershing believed him to be indispensable. After dinner, Patton and Eisenhower took Conner for a tour of the base, and discussed how tanks would influence the future of warfare. They conversed into the night with Conner taking a keen interest, questioning them intensely about their ideas about using tanks in war. Conner was impressed with Eisenhower, and when he received command of an infantry in Panama he asked Eisenhower to join him as his executive officer. During his tenure under Conner they embarked on a learning experience that Eisenhower would call“the most interesting and constructive” tour of his life. 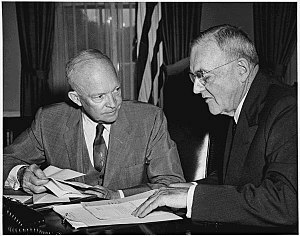 Conner encouraged Eisenhower to read historical novels and military literature. Eisenhower read Clauswitz’s On War three times, and read many books on the battles of the Civil War. Conner and Eisenhower would often reinforce this book knowledge by having long discussions about the contents, and exploring alternatives to the way various battles were fought. Conner would have Eisenhower write essays on the reading material, and edit them mercilessly to make them clear and concise. In 1925 Conner had Eisenhower enrolled in the Command and General Staff School at Leavenworth, Kansas. The course was extremely intense and the competition among the attendees was fierce. But rather than shrink from the pressure, Eisenhower eagerly embraced it. He went into the school with every intention to be number one in his class. Eisenhower excelled at solving the case studies with his teammate Leonard Gerow, which sharpened his strategic and analytical skills. He believed it was better to solve problems with a rested mind so he would limit his study time. When he did study it was with intense focus and concentration, which allowed him do accomplish more in less time. He was able to grasp critical details but not get overwhelmed by them. When establishing various strategies he would turn ideas into actionable plans, emphasizing the need for teamwork and a smooth running organization. His years of study on his own and with Conner paid off as he displayed a mastery of his profession, and when the course was over, Eisenhower was ranked number one in the class, just as he intended. It was a great accomplishment, and one that didn’t go unnoticed by Eisenhower’s senior commanders.